Oh hey! Thanks for being here. This is my very first blog post. After years and years of putting it off, I've finally decided it's time for me have my work online in a more personal way. I'm pretty excited about it, actually, and I hope you like it. Please leave comments! The blog will not be wordy...just pictures and the story behind them. My trials and tribulations, I guess. This is Ayden. The Cherry Brook Zoo invited families to visit the animals, eat chocolate, make crafts, and of course, see the Easter Bunny. After shooting some pretty boring pics of kids getting their faces painted and making sheep out of cotton balls, it was time for me to get to my next assignment. But the Easter Bunny still had not made an appearance, and that was the money shot! I needed it real bad. The reporter had talked to Ayden's mom, so we wanted to get a pic of him with the Easter Bunny to go along with the story. Luckily, on our way out, we found her hopping around the entrance gate. The second Ayden spotted her, he put his hands over his face. 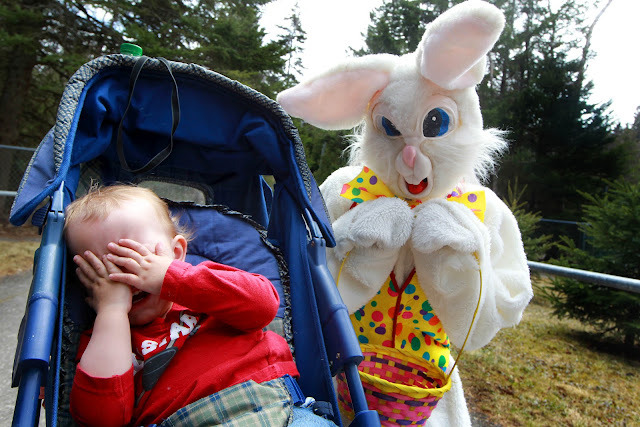 When the bunny crouched down next to his stroller, he started wailing, and that was the shot. HILARIOUS! Why does the Easter Bunny look so creepy?! Half of it's mask was sort of caved in, which accounts for that mean looking eye. Oh man...sometimes things really just work out so perfectly. yay! thanks candice. my first comment! Professional photographer. Foodie, drummer, roller derby player, art lover.